Is road salt ruining our water? The last couple of winters have had a strong grip on the region, making driving a challenge. Communities across the region use road salt to melt snow and ice and keep drivers safer, but at what cost? Use of road salt in the northern U.S. has doubled the amount of chloride in rivers and streams in just two decades (1990-2011). “It’s estimated that more than 22 million tons of salt are scattered on the roads of the U.S. annually—about 137 pounds of salt for every American,” according to a Jan. 6, 2014 story at smithsonian.com. A recent report showed that chloride levels in rivers and streams were highest in the winter, but chloride concentrations were rising even when road salt wasn’t being applied. This suggests that after salt applications, chloride was temporarily stored in shallow aquifers and then slowly released into rivers and streams throughout the year. Runoff carrying road salt can have negative impacts on aquatic ecosystems but doesn’t present much of a threat in the Great Miami River. Data collected on the Great Miami River near Miamisburg shows that increased chloride concentrations from road salt applications don’t last long and the salt flushes through the river fairly quickly. Perhaps, a greater threat is that dissolved road salt can penetrate into groundwater used as a source for drinking water. Salt reaching our aquifers (which stores groundwater) does not flush through as quickly as it does in rivers and streams. In extreme cases, improper storage or use of road salt can impact the quality of drinking water. High chloride levels in drinking water forced the community of Camden to shut down a well in 2010. For years, chloride levels in the aquifer at Camden appeared to be relatively stable. But in 2009, chloride levels tripled, jumping from around 40 milligrams per liter to 120 milligrams per liter. That’s the same year that Camden residents began to complain about a salty taste in their water. The cause was a large road salt storage facility located near the well field (drinking water source) that was not covered. When rain dissolved some of the salt, it was carried into the aquifer underlying the facility. Eventually, the levels of dissolved salt in the groundwater forced Camden to shut down the well so it was no longer used for drinking water. Camden was forced to seek an alternate source of drinking water. The U.S. Environmental Protection Agency has set a secondary maximum contaminant level for chloride at 250 mg/L. Chloride in groundwater does not present a direct health risk. It does however present a taste issue when present in high enough concentrations. Guidelines for constructing salt storage facilities. Recommendations for covering salt stored outside. Managing storm water that flows off the storage site. In addition to implementing guidelines for salt storage, communities can address potential impacts of road salt applications on groundwater through their source water protection programs. The bottom line is we need to be aware of the most sensitive environments where road salt storage and applications have the greatest potential to get into aquifers. These areas can be mapped and monitored. 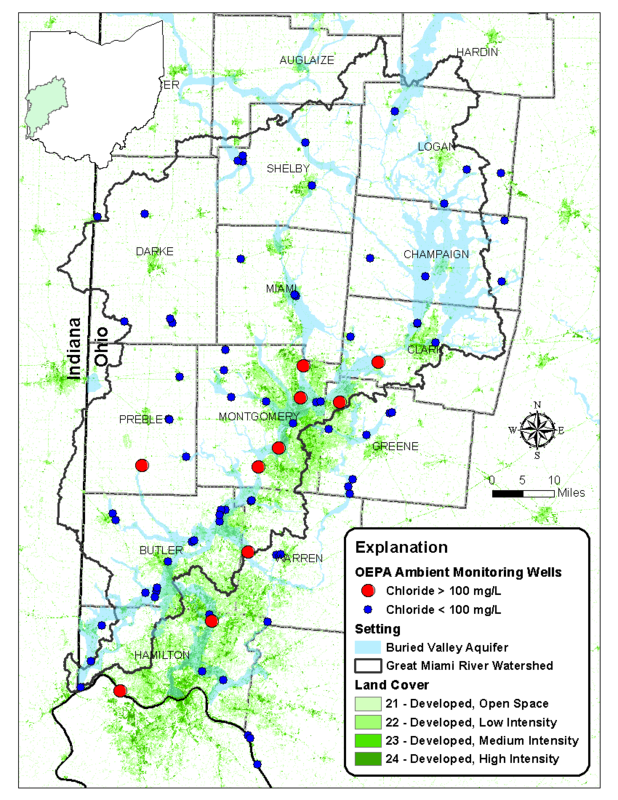 If chloride levels begin to rise communities can reduce applications in the most sensitive areas near well fields. Notice that the wells with the highest levels of chloride are in developed areas, most likely reflecting impact from road salt applications. Region’s water levels more stable than other parts of the U.S. Stories about droughts, water shortages, and aquifers drying up are in the news with regularity these days, especially in places throughout the western United States. What are the chances that our aquifer could run dry? Are the water levels in the Great Miami River Watershed and its buried valley aquifer increasing, declining or staying the same? According to the measurements taken by MCD over the last 30 years, the water supplies in the Great Miami River (GMR) Watershed are in what’s called a steady state. That means the amount of water that flows into and out of the watershed – the 4,000 square miles of land that drain to the Great Miami River – is relatively constant over the last 30 years. In 2014, the Great Miami River Watershed received 39.05 inches of rain and snowmelt (inflows) – which matches the long-term average. That amount of water equals 2.7 trillion gallons of water. Water leaving the region through evaporation and plant uptake (outflows) averages about 26 inches or nearly 1.8 trillion gallons. On average, another 900 billion gallons of water flows into the Great Miami River through runoff each year. Runoff is water that flows over the land (overland flows), runs through soils (interflow) and into the aquifers (groundwater flow). That’s 2.7 million gallons into the watershed and another 2.7 million gallons out of the watershed. 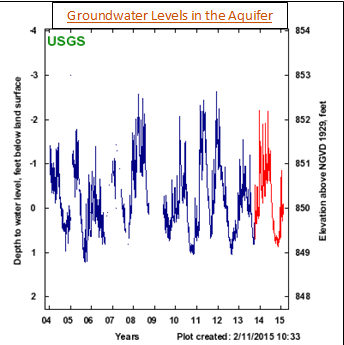 Graph shows seasonal fluctuations in the depth to groundwater. Over the last 30 years, there is no upward or downward trend. 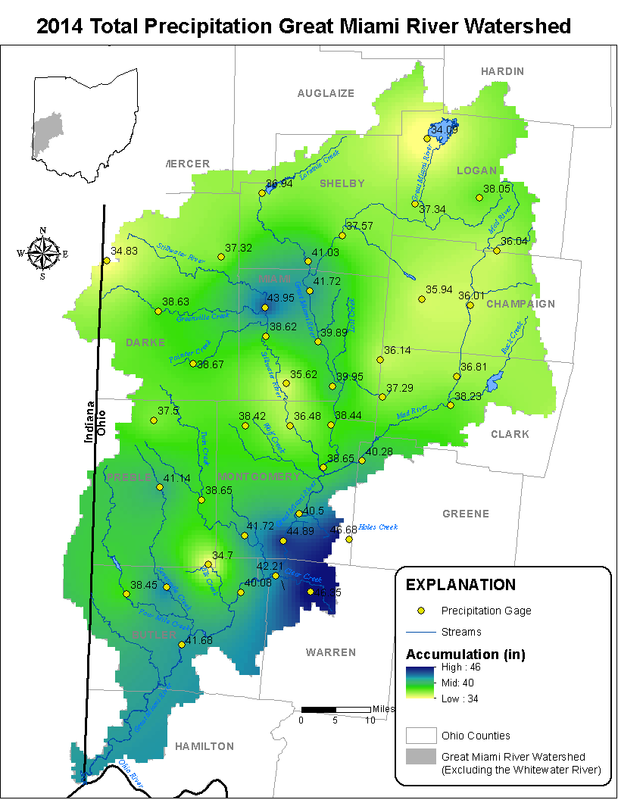 There are fluctuations in water levels year to year, but over the long term, precipitation and runoff balance each other out, leaving the total amount of water stored in the Great Miami River Watershed essentially the same. Another factor in water usage is human use. The Ohio Department of Natural Resources says people use about 124 billion gallons of water per year, mostly for public water supply, industry, and cooling water for power generation. Most of that water returns to the Great Miami River Watershed through municipal sewer and industrial wastewater treatment plants. Of the 124 billion gallons of water used by people, MCD estimates only about 23 billion gallons of water is actually consumed or removed from the watershed before it reaches the Great Miami River. Although 23 billion gallons of water sounds like a huge quantity, it’s only a small amount when compared with the 2.7 trillion gallons that enter and exit the watershed each year. While our water levels are steady today, that’s no guarantee for the future. Changing weather patterns and increasing water uses by people are unknown. That’s why it’s critical to track water over time and why MCD measures precipitation and river flows throughout the watershed using a network of gages. Keeping an eye on water levels is vital to detecting trends so that policies and programs can safeguard our water supplies.